On June 28, 1938 Oskar Schindler was interrogated by Czech police at the city of Olmütz police station. The document in our hands alleges that Schindler had spied for Nazi spy chief Vice Admiral Wilhelm Canaris (later hanged by Hitler as a traitor). 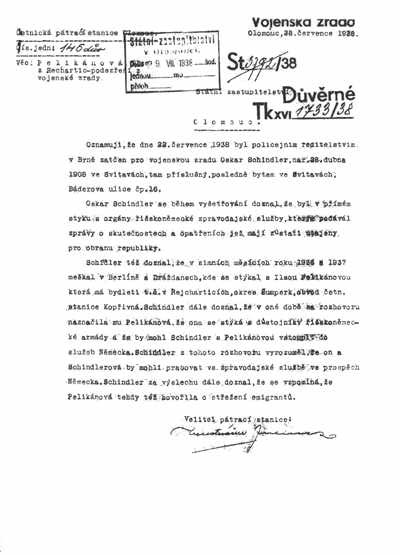 I would advise you that on July 22, 1938 the Brno City Police Directorate arrested for military treason Mr. Oscar Schindler, born April 28, 1908 in Svitavy, where the accused resided at No. 16 Báderova St., Svitavi. Under interrogation Mr. Oscar Schindler has confessed that he was in direct contact with organs of the German Reich Intelligence Service (Abwehr), to which he was passing information on the current situation and on measure which should remain secret for defence of the Republic. Schindler also confessed that while residing in Berlin and Dresden in the winter month of 1937-1938 he associated with Ilsa Pelikanova who is said to reside at Rejchartice (District of Sumperk), local police station Koprivna. Schindler further confessed that in conversation with Pelikanova during the same time she indicated that she is in contact with officers of German Reichs armed forces that Mr. Schindler and Pelikanova join services of Germany. Mr. Schindler understood from this conversation that he and Mrs. Schindler could work in intelligence service for benefit of Germany. Mr. Schindler further admitted under interrogation that he remembered that Pelikanova mentioned the guarding of emigrants.